“Daydream Believer”: using the power of the image to give invisible dreams a visible form. This is the 11th installment in a series of articles produced collaboratively by the Tokyo Culture Creation Project and Tokyo Art Beat. In this piece, TABlog writer Rei Kagami covers the 3rd Yebisu International Festival for Art & Alternative Visions, held at the Tokyo Metropolitan Museum of Photography from February 18-27, 2011. In the runup to the festival, shocking pink posters started to appear in train stations in and around the Ebisu area. Even those who had not been aware of the festival’s existence must have had their appetites piqued, wondering what the fuss was all about. This piece takes a look at the main highlights of this ten-day festival, also known as “Yebizo”. The title for this year’s edition was, quite evidently, taken from the Monkees’ hit song of the same name. Just looking at these two words probably set this cheery, rousing melody ringing in the minds of many. The strikingly apt title, chosen by curator Keiko Okamura, likens the cinematic experience to the act of watching a dream unfold while still wide-awake. 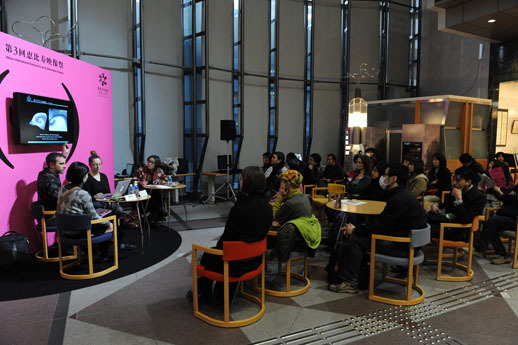 As with previous years, the program for this year’s Yebizo stretched over a ten-day period and included screenings, exhibitions, live concerts, performances, talks and more, all held at the Tokyo Metropolitan Museum of Photography. A total of seventeen films were screened on a rotating basis over the ten-day duration. The lineup included some extremely rare films that typically only make it to the screen during festivals, and it would have taken several days to view the entire selection. For busy folks with full-time jobs who can only take time off during the weekends, Yebizo forced them to make some difficult choices. Several silent and experimental independent films were also featured. An important part of any film festival, this section invited viewers to reevaluate their own consciousness of the medium through a showcase of how cinematic culture has evolved over time, the motivations of individual filmmakers, as well as changes and shifts in methodology. Yebizo also offered viewers an overview of world cinema. German filmmaker Harun Farocki, whose films have received little exposure in Japan, presented a retrospective program that included both early works and his latest projects. There were also films by artists from Australia and New Zealand, and a special section of Croatian “anti-films” from the 1960s that defied the conventions of the time. Of course, one of Yebizo’s biggest draws was the chance to see works by contemporary artists active today. A particular highlight was ‘Midori-ko’, the new feature-length film by Keita Kurosaka, a Japanese animation whiz with a cult art-house following. The exhibition section of the festival, which had no entry fee, featured works by sixteen artists displayed throughout the entire museum, from the third floor all the way down to the basement. The first work on the third floor was ‘Window’, an early effort by Thai director Apichatpong Weerasethakul, who won the Palme d’Or at Cannes last year. Ghostly images of light reflected off a TV screen are “discovered” when seen through the lens of a camera. Invisible to the naked eye, this light flickers to and fro, ushering viewers into a daydream-like stupor. Each of the works on display offered viewers a visual experience that was unique to the moving image. Javier Téllez’s ‘Caligari and the Sleepwalker’, for instance, is a contemporary remake of the German Expressionist masterpiece ‘The Cabinet of Dr. Caligari’ featuring patients from a local psychiatric clinic as actors in the film. As one of the characters has it, “this entire world is an illusion”: Téllez offers us a profound depiction of a contemporary society where reality mingles with fiction, and madness with sanity. Chikara Matsumoto, who makes films out of handmade drawings, presented a series of works that formed the basis for his animations, as well as a sculptural installation that offered visitors an insider view of the universe that appears in his films. 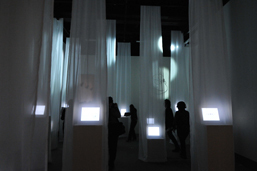 The exhibition setup was a concrete manifestation of Matsumoto’s worldview, in which “mental time travel, where one’s past and future comes and goes, actually becomes possible”. 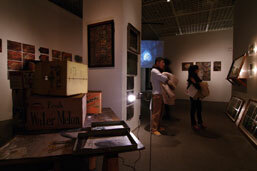 The exhibition in the basement featured several works that prompted viewers to reflect on the way in which the moving image has been absorbed into our contemporary lives: the intermingling of real and fictional worlds, the ambiguous boundary that divides one from the other, as well as the occasional reversal that occurs between them. Cao Fei is a Chinese artist known for her works that take place against the backdrop of ‘RMB City’, a fictional universe constructed on the Internet. For Yebizo, however, Cao showed ‘RMB City Opera’, a video that depicted a man and a woman having a conversation in an imaginary world via their respective online avatars by entering text onto a screen. The act of watching them “perform” a second self in an imaginary space forces viewers to confront the question of how modern human relationships have changed and evolved as a result of developments in video technology and telecommunications. Cao’s work also embodied the sense of crisis over the increasing difficulty we face when trying to judge the relative fictitiousness of imaginary spaces as opposed to the “real” world. Harun Farocki, on the other hand, explores the military applications of video footage in his “Serious Games” series. These works introduce viewers to the simulation systems deployed by the US Army for training purposes. The practice sessions that Farocki captures on film unfold just like a scene from a computer game: soldiers onscreen fire away at people in imaginary spaces and lose their own lives in combat. The same simulation technology is also used to treat returning soldiers with post-traumatic stress disorder – Farocki shows us how this is performed using a split screen. 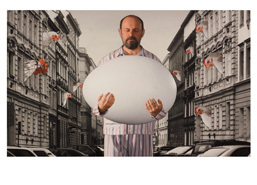 Again, this work highlighted the role of the moving image as an intermediary that moves between reality and fiction. Finally, a brief look at two works by Kotobuki Shiriagari. ‘Madame Daydream’, a video installation projected onto several monitors installed on the landing of the museum staircase, featured fifteen stories that conclude with a twist – each of their female protagonists come to the realization that it was all a dream at the end. 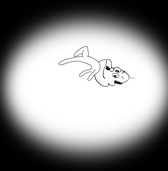 Along with “yuru_mation”, a series of low-resolution line drawing animations projected in the basement gallery, Shiriagari’s installations offered viewers the opportunity to let their guard down for a brief moment and revel in a whimsical, imaginary world. Overall, the Yebizo exhibition gave audiences both profound material to ponder and a surfeit of imagination to get lost in. Despite the diverse selection of work, the theme was given ample consideration, and the whole exhibition stood on its own thanks to the skillful curation. The proportion of video and film works at recent contemporary art exhibitions has been increasing, evidence of the fact that the moving image is now regarded as a natural, almost commonplace medium of artistic expression. As obvious as it may seem, the artistic appreciation of these works, on the other hand, requires a device that allows the viewer to play them back. As filming and playback technologies continue to evolve at a steady pace, some films will be left behind, unable to be viewed on today’s projectors. Even playback devices for 8mm and VHS films have already become difficult to obtain. This year’s screening program included a selection of rare Japanese films from the 1920s-1950s taken from the Kobe Planet Film Archive. Since some of these works could not be screened on today’s projectors, however, new prints had to be made. Many film and video works are made using the most advanced technologies at any given time. As such, the history of film might be said to also represent the history of technological progress. Although storage and maintenance costs may well be considerable, the conservation of playback devices along with the films themselves is an important project that will allow them to be viewed using the media of the age in which they were produced. This is imperative not just in the field of art, but also for science and technology. Held for the last three years as part of the Tokyo Culture Creation Project, the Yebisu International Festival for Art & Alternative Visions will hopefully continue to serve as a historical archive of technology in the years to come. Practical film theory developed in the late 1960s and early 1970s in order to explore new filmic possibilities. This period of turbulent change, during which the role of film as a quintessential twentieth century medium was being questioned, saw the emergence of such figures as Masao Matsuda, a revolutionary film critic who launched his career in the 1950s and shook up the entire industry, as well as director Masao Adachi. These figures were deeply critical of existing films that were based on a capitalist system and auteur theory.